On Monday night I watched a video on my local PBS station that was both fascinating and depressing. You know the kind. The images replay through your mind as you drift off to sleep and linger the next morning like a kind of cloudy malaise. I don’t mean to suggest that the film is full of gruesome death camp photos, but that the subject matter’s stark and disturbing reality weighs heavily on the human psyche. For me, there is even a personal connection. Although my family is not even a little bit Jewish, my paternal grandfather’s brother died in Dachau concentration camp. He was a Czech border guard who refused a Nazi officer’s command to shoot people escaping across the border. He was sent to Dachau as punishment and he never came out. This entry was posted in Ancestry, Family, History, Relationships and tagged concentration camps, Holocaust, Independent Films, Nazi War Trials, Philippe Sands, Poland, World War II by thebohemianfreethinker. Bookmark the permalink. I have many mixed emotions about the entire Nazi horror (including my disgust with Pope Pius XII, but don’t get me started on that!). Although I was born after WWII was over, it was still going on when I was conceived (in Germany, of all places!). As an adopted child, I always knew that my parents had adopted me, and that my biological mother was “unable to care for me” for some unexplained reason. When I got to be a teenager and learned about “illegitimate” children, I thought, “okay, so that’s it. My parents weren’t married.” I never had any issues with that concept. Only after my adopted parents had both died was I able to access the contents of their safe, where I found a number of documents indicating that my biological father was an American GI who married a German girl near the end of the war. I suspect she got pregnant with me, and his CO made him marry her. That didn’t happen in later wars (i.e., Vietnam), but morals were different in the 1940’s. Anyway, my mother was sent to Pennsylvania to live with my father’s family while he was deployed in the occupation of Germany. I cannot imagine what her reception was when she arrived there. Hatred of all things German was rampant — so much so that some people actually killed dachshunds because they were German! Did she speak enough English to get by? Did my paternal grandparents initially look forward to my birth? I’ll never know. Before I was born, my father was killed (in a Jeep accident, I think) in Germany. As soon as I was born, my mother gave me up for adoption and returned to Germany. Apparently, my father’s parents didn’t want to keep their son’s child if the other half of the DNA was a Nazi. Or maybe there was another explanation. Again, I’ll never know. I was adopted when I was only eight days old. At one point, I tried to rationalize the situation by believing that my mother (and perhaps my father) were Jewish. My original last name was Kramer, and I have known some Jewish people with that name. I went to a college with a large number of Jewish students, and my first serious job after graduation was in New York, where I had many Jewish co-workers. Some of my best girlfriends (and hottest dates!) during those years were Jewish, so I thought maybe I was too. But the more I watched TV shows and read books about the Holocaust, the more unlikely that scenario seemed. So few young Jewish women were still alive in Germany in 1944 — what were the chances? Whatever the case, I have made my peace with it. I never really think of my biological mother as a Nazi. She was just a young woman caught up in a global tragedy. But my fascination with that time in history still remains. 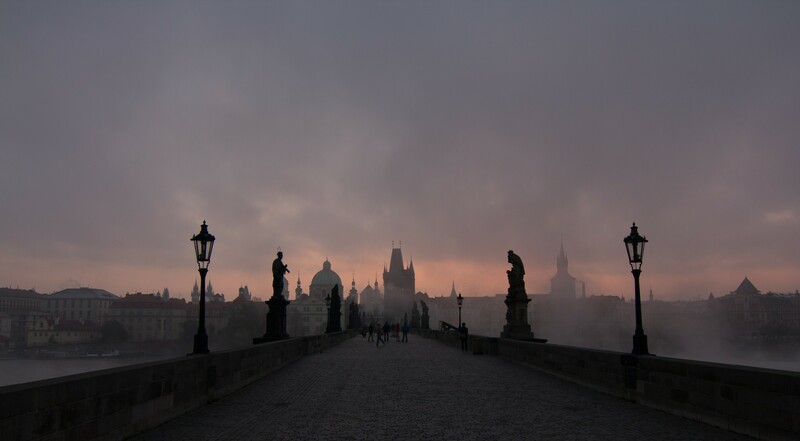 When I visited Prague a few years ago, I became interested in the uniquely Czech part of that history. I was delighted that Prague had been spared Nazi (and Allied) bombing, but I was stunned by the fact that Hitler had deliberately preserved Prague (and its Jewish quarter) so that it could become a museum about the Jewish people (who presumably no longer existed, if he had had his way). I have an excellent book to recommend to you. It is UNDER A CRUEL STAR: A Life In Prague 1941-1968. It takes the reader from the scourge of Hitler to the scourge of Stalin and beyond. The author is Heda Margolius Kovaly. It’s a good read, and makes one really appreciate the strength of the Czech people! Linda, thanks so much for sharing your very personal and fascinating story with us. As a history lover, I know you will enjoy this remarkable documentary. Thanks for the book recommendation as well. I will definitely put that on my reading list.